After 5 years of trimming, my hair today is 72"! I estimated trimming 30" in the last 5 years! 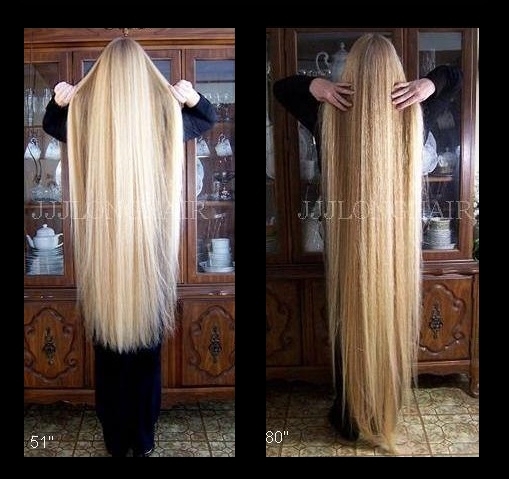 In this video my hair was 73". The most I took at once was 10"
My plan was to maintain and trim which I have done! To get a thicker hemline and hair a bit easier to manage means trimming quite a bit. Its all part of the journey. I have put this off for years but feel its coming this summer. My first trim will be at least 15". 😳I have never self trimmed that much before! I hope you will still follow my Journey when I go to shorter lengths! I am having trouble combing it and sleeping with it being this long. KNEE LENGTH IS STILL LONG! I will self trim it of course. I have been self trimming my hair since 2006! I want to do some videos before the big trim and now that the weather is turning better I feel a bit more motivated. Time and planning and making videos have been an issue as I have had little time to update online. But my hair is the same as in the above video! Thanks for reading and if you feel like leaving a comment please do so. I would love to hear from you! Happy Holidays to all and Happy New Year! 2019 will be the year when I do my big trim. There have been many delays due to personal family business I needed to focus on. I have continued trimming after my first 10" trim in Sept 2017. Total of 20" has been trimmed...My hair is still to the floor. I wanted to get back into having fun with hair so I started working on some hair accessories. I made 3 videos about my favorite thing...CLAW CLIPS and custom painting them! You can see them over on my YouTube Channel and to make it easier I can also link them here. I show them in my hair and the buns are current ones with floorlength hair. 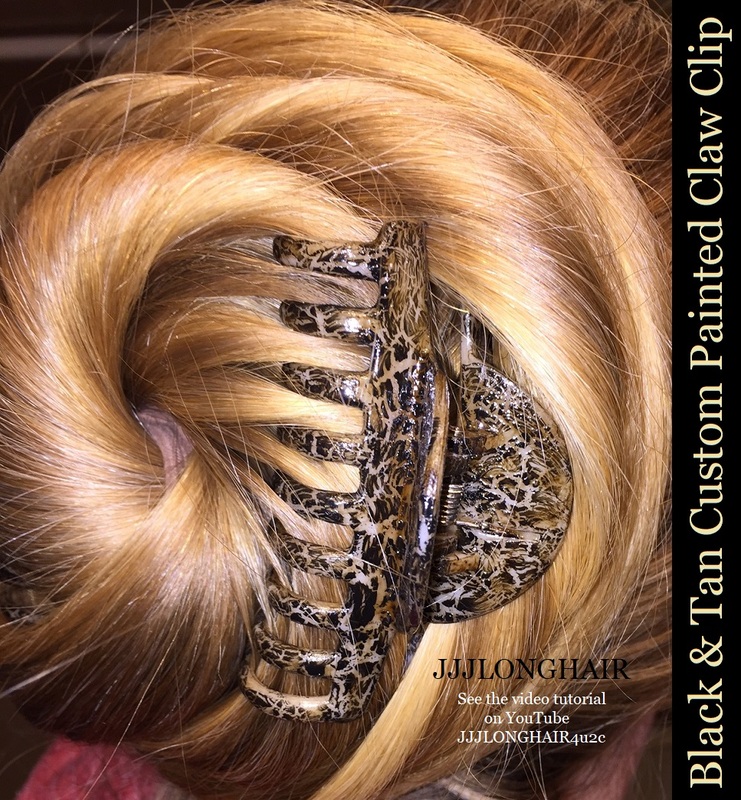 I also made a PAGE over on my hair site and its under construction but you can see some clip photos there. Video Below is where I SHOW the ones I have painted. 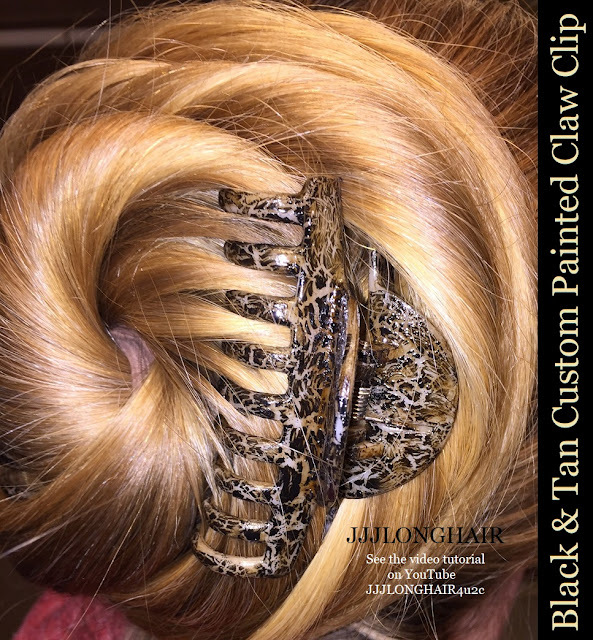 CLAW CLIPS have helped me on my long hair journey more than anything! Wearing hair up was crucial to gaining length. So let me focus again on hair and check back for updates! Remember, you can comment below! Lets face it...age and stress have thinned my hair at the longer lengths, plus some brutal winters where I had massive tangling that was hard to correct.The journey has been very difficult at times! TODAY my hair is 74.5 and seems to be growing faster and as soon as I trim it is right back! My plan is to film a self trim video and cut 2-3" and show how easy it is. My hair has thinned so much from classic to floor that if I cut 12" I really don't think it would look much thicker. Shorter length like classic might be better, but right now that seems too drastic. I will say that my hair is in great condition. I guess we cant have it all can we! I appreciate what I have and am working with it. People are asking for length photos and videos so let me see what I can come up with. I did show length in a couple recent videos on YouTube- wet to dry and making braid waves. 💜So you can see my hair is still VERY long and may seem thick enough.. and I wanted to create these videos before I go shorter. I will maintain my hair around ankle after the trim video I have planned. I am STILL finding out what my best hair length should be. Right now it is VERY LONG and I believe once I trim shorter I will not grow to this length again. Let me take my time getting there! Easy styles for long hair! Click link below. finally... my hair trim video! Although this was from September 2017, I finally got around to sharing it here. It's NOT public on YouTube and is for this blog ONLY. Many things prevented me from working on this video including my computer crashing, but here it is! TODAY my hair is still 73" and I want to maintain it for a while around 68-70"/floor/ankle range to thicken up the ends if possible...My hair really needed this trim and I was very happy with the outcome and say goodbye to my longest, oldest hair. I have done several small 1"/ 2" and dustings trims since this video and will continue to trim monthly. Trimming is all part of the growing journey, so for those few people who are upset, please don't be! FYI my hair grows about 7" per year. How do I wear all of this hair??? As I get ready to trim my hair I wanted to make a poll to see what you think. I have noticed many different opinions in the last few months from friends and fans and thought it would be fun to make a poll so all can see. Some people could care less and some are very upset I am trimming my hair. Others understand the difficulties or challenges of extreme length. Some are with me no matter what. What do you think? Lets take a POLL! Perhaps viewing my recent slideshow will give you an idea of the many lengths I have had. I tried to post the poll here on my blog but it didn't work right! Nothing to sign up for to vote and you can view the results right away! The poll is on a safe page over on my long hair site. I will trim my hair after I make 1 or 2 more videos to record the final longest length. 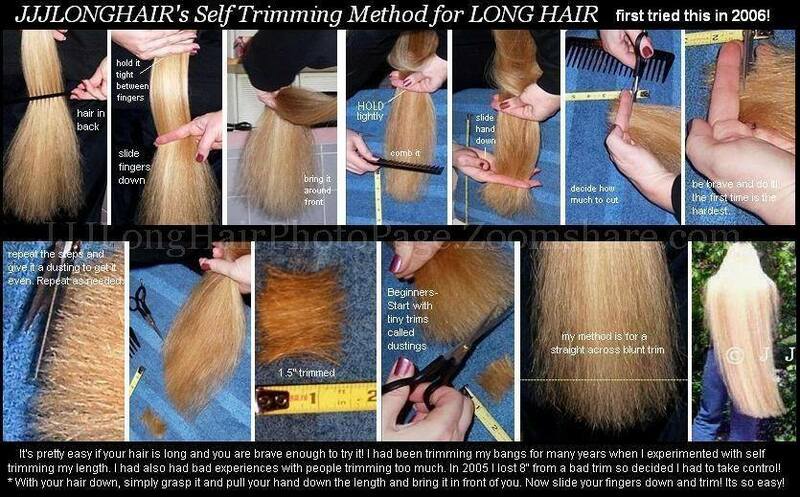 I am trying to do this as soon as possible and move on with the trim. In the meantime, here is a poll to keep this blog active! Thanks for your participation! 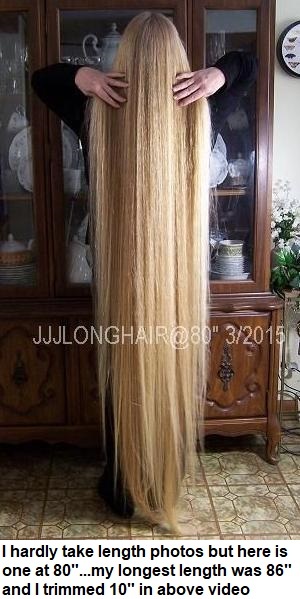 (and your patience) My hair is about 84" long and past the floor for anyone wondering. If you rather leave a comment, please feel free to do so below!